Biogenic amines, a class of neurotransmitters, include catecholamines, indolamine, and imadazoleamine. It is an important class of neuroactive substances that are released by action potentials, long distance signaling, from neurons. After their release, these molecules bind to specific receptors that are located on the target cell membrane. Activation of biogenic amine receptors results in changes in the intracellular concentration of second messengers that are responsible for slow but long-lasting cellular responses. Pharmacological, physiological, and molecular approaches have helped in elucidating that biogenic amines regulate a multitude of cellular responses in both vertebrates and invertebrates. Figure. 1. Chemical structures of five classical biogenic amines. In vertebrates, dopamine, norepinephrine, epinephrine, serotonin, and histamine have been considered to be classical biogenic amines (Figure 1). 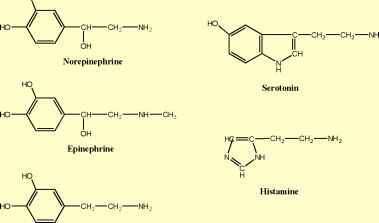 Serotonin and histamine are also present in invertebrates. Norepinephrine and epinephrine are functionally substituted by two structurally-related phenylamines, tyramine and octopamine, and both mediate diverse physiological functions in invertebrates. These amines are present at very low concentration in the mammalian brain, except in certain human disorders, suggesting that they may have some physiological significance in vertebrates. Catecholamines include a group of important neurotransmitters that share a common ring structure, catechol (C6H4(OH)2). Catecholamines resemble one another chemically: (1) by having an aromatic portion (catechol), and (2) a side chain, an amine or nitrogen-containing group, attached to the catechol ring. 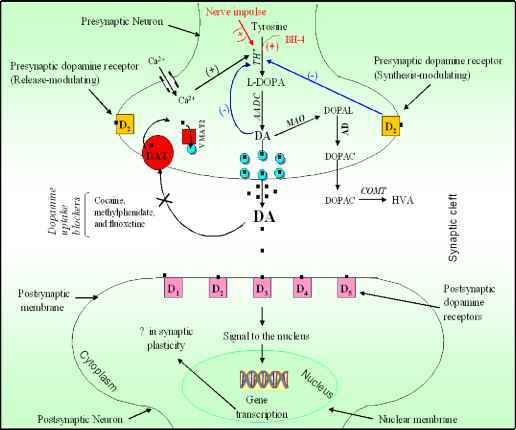 The most important catecholamines in vertebrates are dopamine, norepinephrine and epinephrine, which play key roles in neurotransmission and other signaling functions. The deficiency or excess of these amines in human brain is responsible for the symptoms of neurodegenerative, neuropsychiatric and neurological disorders (such as Parkinson's disease, Alzheimer's disease and schizophrenia). Let us next look briefly at the metabolism of catecholamines.